What burners to get for your half barrel brewery? Doing my research, people from the homebrew forums tended to err on the side of giant, 24 tipped after-burners. From a few responses, these seemed overkill. There were also a lot of issues that people had with soot and an unclean burn. This made the decision very difficult. Using propane or natural gas was another big decision. Propane would have been way easier as I wouldn’t have had to plumb pipe. But since I was brewing inside a ‘Florida Room’ I converted, I thought it would be safer to plumb natural gas. 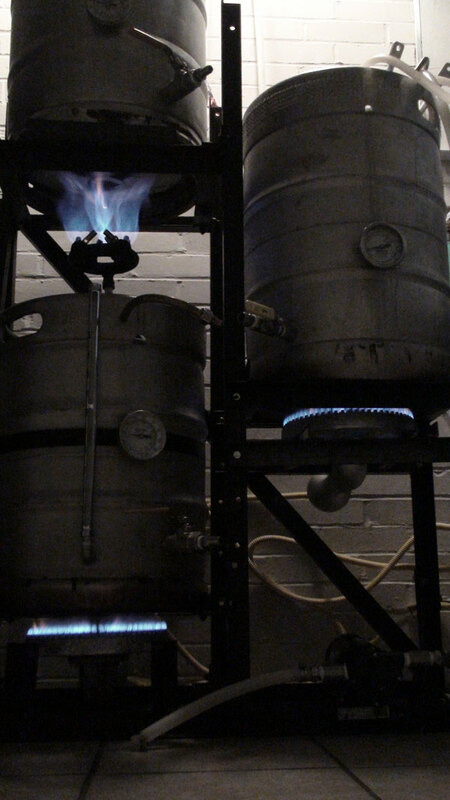 Also, if you are a half-barrel brewer, you SHOULD use natural gas, it will save a lot of money. I do know that tanks of propane for grills are between $20-$30. I know I would go through one of these on a triple 15 gallon batch – it definitely would last me 2-3 days of brewing…and I dislike switching out propane tanks. It is well worth the effort and money to have a qualified plumber run a line to your brew room. Have an experienced plumber do any gas plumbing as it will be well worth your while. Make sure to have a valve installed where you tee-off the supply to go to your brew room. Then have valves for each burner. For safety, you want turn off your main-line valve evertime your are done brewing so that nobody can accidentally turn on the gas to your burners. Improper installation can result in injury, loss of property and/or death. Never leave your burner on and unattended. If inside, makes sure to install a hood with plenty of ventilation to carry away carbon monoxide, fumes and steam. If your brewery is against a wall, make sure it is against brick with a 1 foot clearance as these burners will throw off some heat. Do not put up against drywall or wood. Small Jet burners or 200+ Flame Large Burner? I couldn’t decide between them so I got a few of each. Cheap. Only ~ $28.00 per. CONS: Uses more gas. Needs more room – at least 4.5″ between top of jets and kettle bottom. If you can believe it, they make up to 44 jet burners. More expensive. 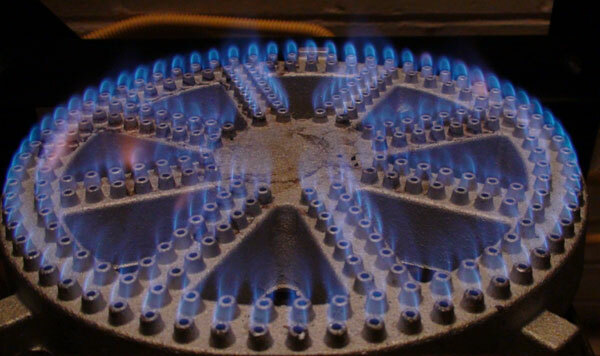 $50/burner + $7/NG orifice = $57/per burner. I actually tested this by firing an equal amount of same temperature water per burner. For each burner I counted the revolutions on my gas meter. 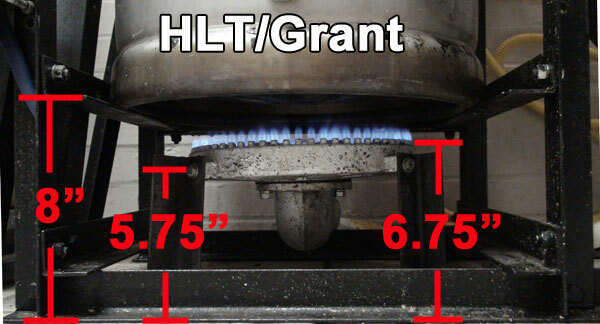 The 10″ burner consumed at least 1/3 less gas compared to the 5″ to bring it up to equal temperatures. It took about the same amount of time for each to get to target temperature, the 5″ just used more gas. For the 5″ jet burner, is is jet-like, so a lot of wasted heat is convecting up around the sides unlike the gentle flames of the 10″ burner. For each burner, I only needed to turn it on less than halfway on the valve. 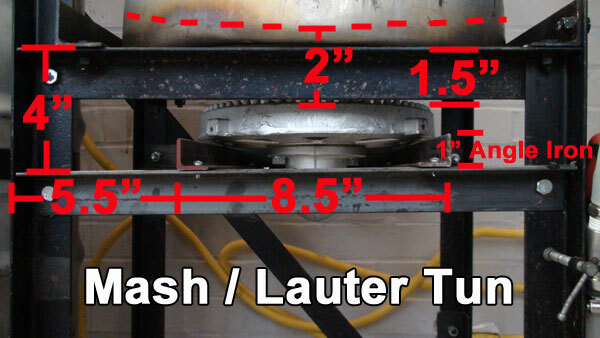 For the 10″ burner, if you turn it on too high, the flames will go around the sides of the kettle and up the sides. 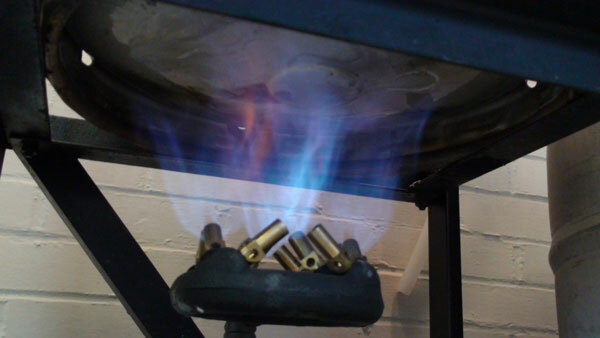 Both burners burned very clean with a blue flame – no soot or smells. From the above picture, you may think that the burner on the right does not put out a lot of heat compared to the jet burner on the left, but you would be mistaken. Even though turned way down, it’s VERY hot and the even dispersal pattern is perfect for a 16″ diameter keg or similar kettle. My mounting solution for this is a little odd so I won’t go into detail. 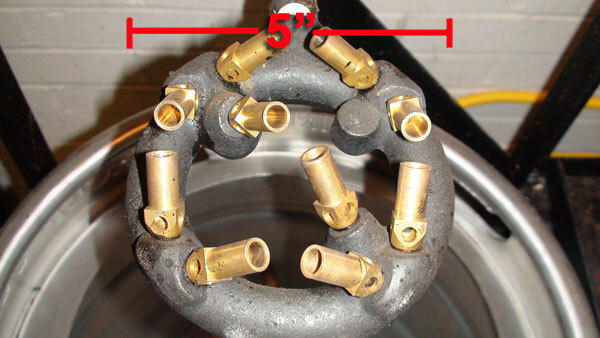 These circular jet burners directly accepts a 1/2″ FPT fitting (female pipe thread). 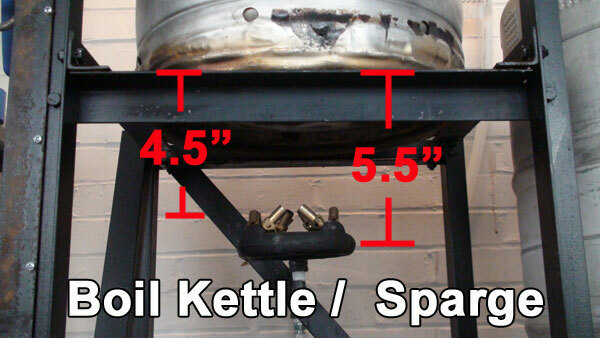 If your burner is different sized, just make sure you maintain around a 4.5″ space between the top of the jet tips to the support bracket for the bottom of the kettle. 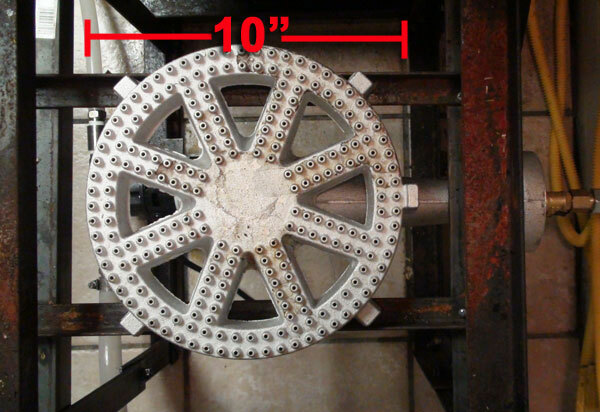 You will notice that this burner is mounted on 1/8″ x 1″ angle iron. It’s not hard mounted, but just sits on top of the support brackets (it’s heavy, it won’ move). If your burner is slightly different, make sure to maintain around a 2″ space between the top of the little jets to the bottom of the kettle. For this burner, I cut some angle iron for the legs of the burner. Again, if your burner is slightly different, make sure to maintain around a 2″ space between the top of the little jets to the bottom of the kettle. Are you sure the jet burner couldn’t be placed closer? If you’re getting a clean burn and burning more fuel, your are making more heat. I am curious as to where the heat is being lost and that is the first thing that came to mind. PS love your build and will likely use it for a future build. Though I am still debating the use of Keggles (even though I already have 3). They are just SO overly sized and heavy. Plus, you can’t (from what I have been told) set them up for a whirlpool. Keep up the good work. The burner could possibly be moved closer. This setup was going off of some other research I did on the net for flame placement if I remember. I was afraid if I got it any closer the flames would lap around the bottom. I was working off of the specs that I gleaned from homebrewtalk posts as far as jet burner distance, so it may be able to be placed closer. You can whirlpool a keggle with a big spoon. 😉 It works decent.